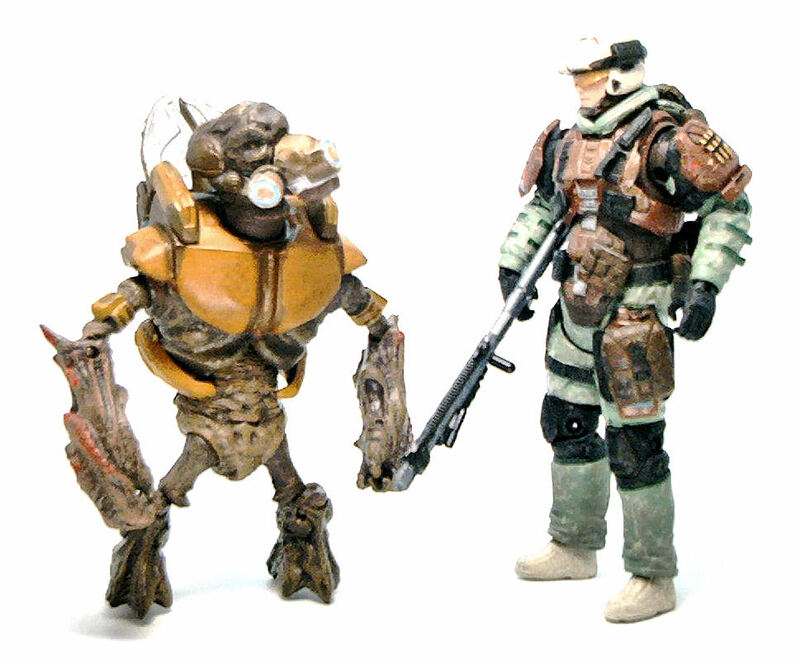 Both figures share the same basic body and come in standard green camouflage. One is classified as a “light” trooper and the other one is called a “heavy” trooper. 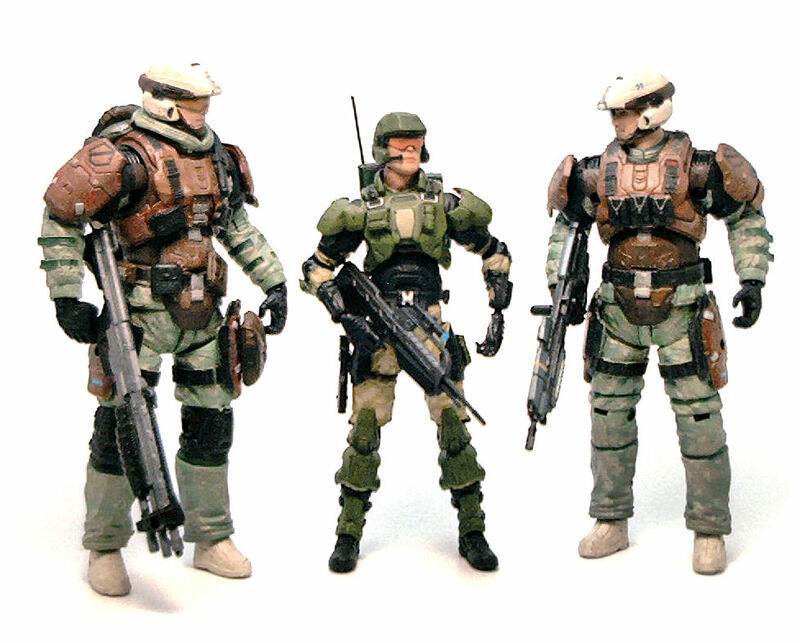 The main difference visible on these guys is the number of packs and pouches attached to their body armor. The sculpture of the basic body is serviceable. The camouflage uniforms have enough wrinkles and folds to look the part, but are otherwise unremarkable. The armor sculpted on top of that looks good though; the plates look sharp and the paneling is clean. 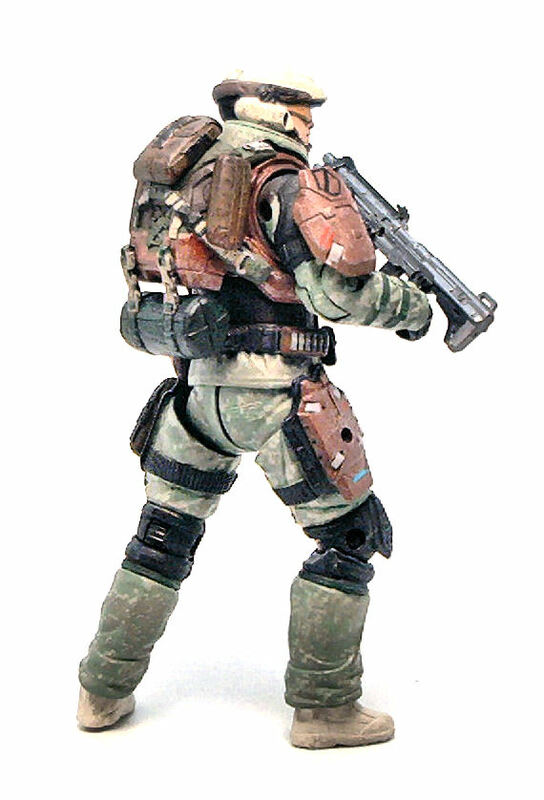 The “light” trooper comes with just a strip of ammo pouches glued to his chest, while the “heavy” trooper has a considerable amount of extra bits glued on, like extra ammo packs, a sheathed knife, a water flask and a bulkier pouch on the left leg thigh plate. 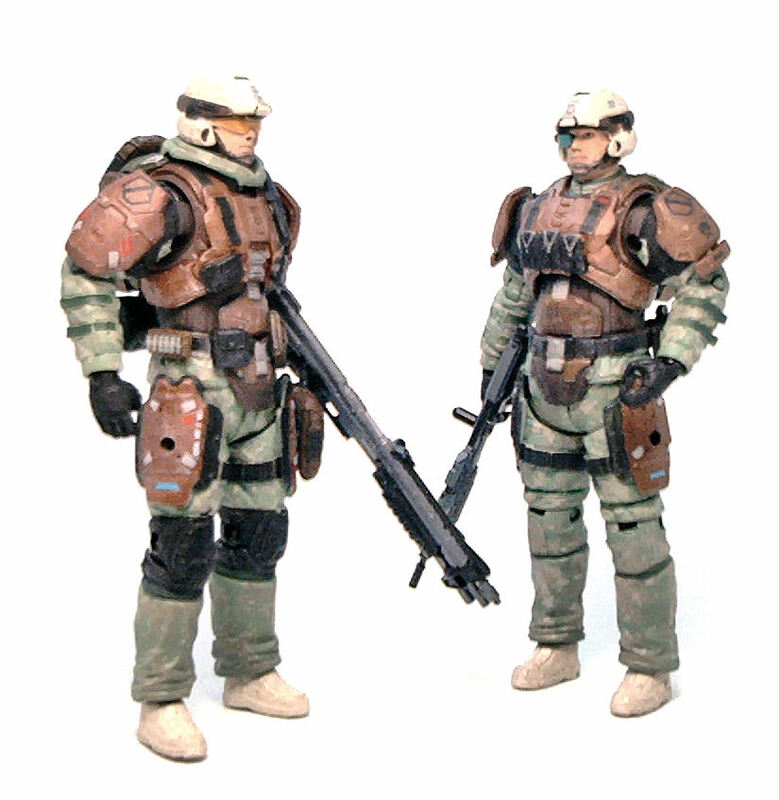 Other differences between both figures are the faces; the heavy trooper wears a full set of goggles, while the light trooper only has a single targeting screen covering his right eye. 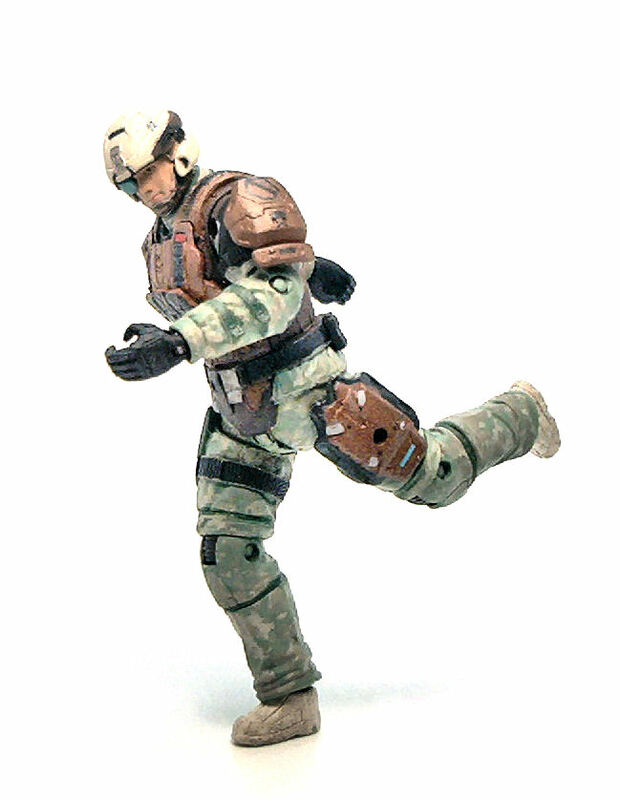 Also, the legs seem to be different molds, as the heavy trooper wears protective kneepads and the light trooper doesn’t. 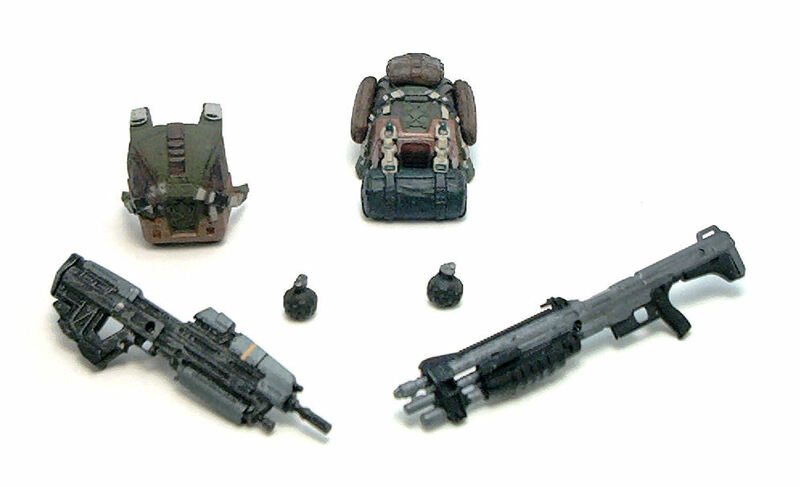 The shoulder pads on both figures are removable and compatible with the regular Spartan attachments. The light trooper wears a matching set of standard shoulder pads, while the heavy trooper has one standard pad on his left shoulder and a bulkier one his right side. Notice anything unusual? Those are a lot of barbell joints, to be sure, but the one glaring omission is a joint that allows these troopers to hold their weapons with both hands. None of these guys can cross his arms over his chest, which is an oversight so huge it’s difficult to imagine how come these figures were released at all. But on to other things. The upper leg joints don’t work quite as well as one would expect either. The hips have very limited range of movement because of the rubber piece that conforms the lower edge of the tunics, and the upper thigh barbells don’t really offer much in terms lateral mobility. The paint job on both figures is average. There are no glaring paint errors on the uniforms, but the overall finish is rather muddy. The faces are painted very plain, even though some efforts were made to add stubble on them, but the end result is not very effective. The one big issue on the faces is that they decided to paint the nostrils on each figure buth the painted shadows aren’t even the same size, which looks very odd. Overall, not the best work I’ve seen from McFarlane. 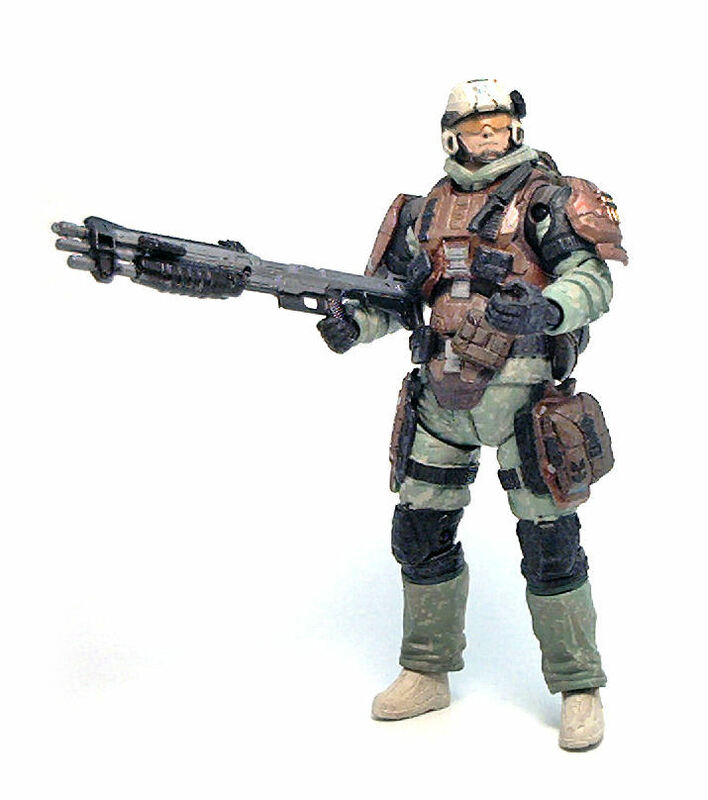 Each figure comes equipped with a backpack and a couple of weapons: The “light” trooper comes with an Assault Rifle and Frag Grenade while the “heavy” trooper features a Shotgun and Frag Grenade. Since the “heavy” backpack hangs too low over the grenade pegs at the back of these figures, I ended up giving both grenades to the “light” trooper. Back before purchasing these guys, I researched some online reviews on these guys and on paper (or on-screen, if you will); the lack of a biceps swivel didn’t seem to be such a big deal. However, once out of the package, this inability to grab their weapons properly, coupled with the leg and paint issues has annoyed me so much that even the thought of fixing them myself now seems like a waste of time. So, Positives: Sturdy construction, nice amount of detail, interesting looking gear. 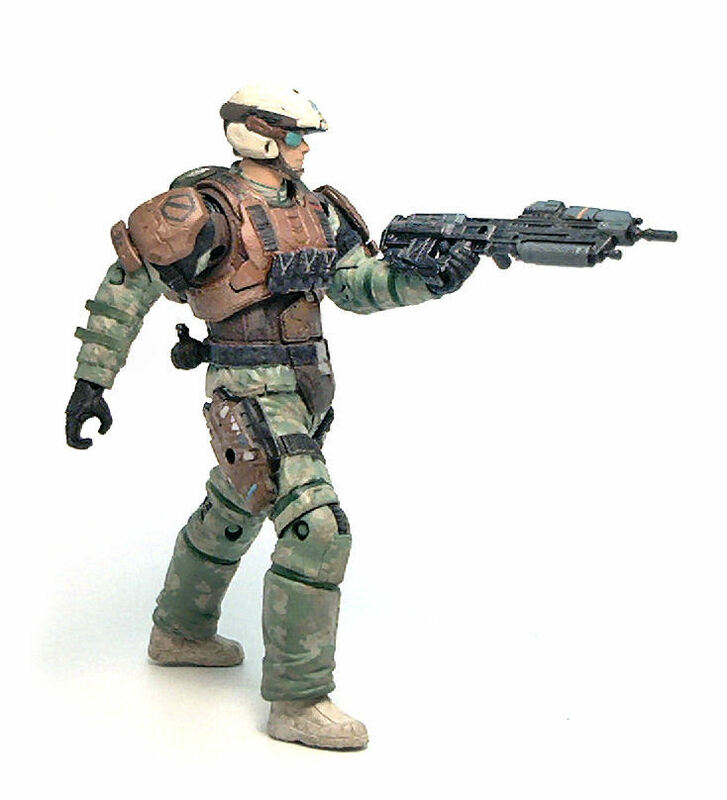 On the Negatives: Can’t hold weapons properly, very limited hip articulation, average-to-poor paintjob. Verdict: Skip them entirely; unless you can find them at such a discount as to make any or all of the negatives fade away. I’m thinking no less than 60% discount, which should be a realistic amount given how poorly the figures based on these molds have been selling. 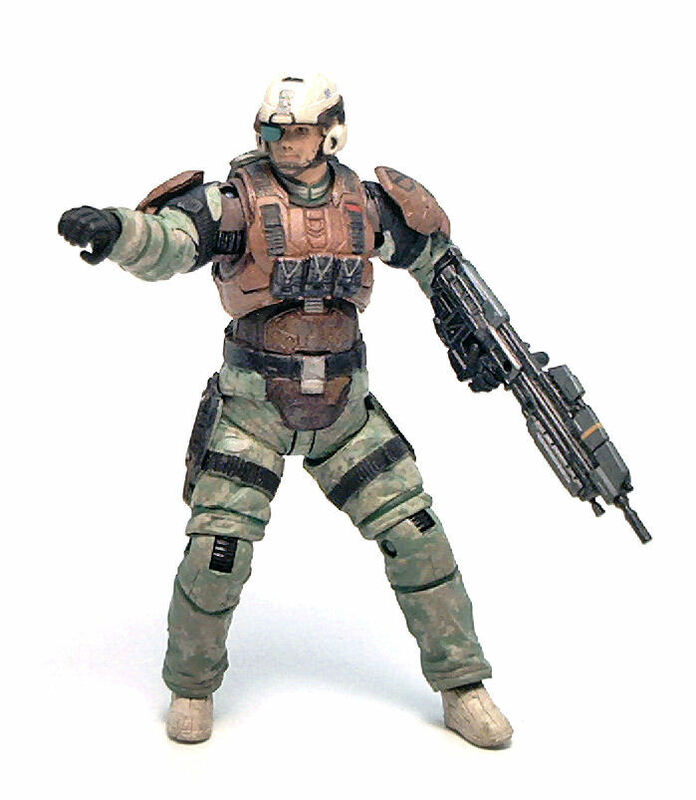 The only reason these UNSC Troopers get a passing grade is because of the weaponry, which can be used by the Reach Spartans, but on the whole these UNSC Troopers are non-essentials as far as I’m concerned.